…..I am sailing the seas with the family right now, but I’ve asked one of my friends to fill in today! Mandy is the author of “Mandy’s Recipe Box” and she hosts a fun linky party on Tuesdays called “Totally Tasty Tuesdays.” Quite fitting, eh? Anywho…that’s where I MET her, and I’m so glad I did! Otherwise, you’d be hearing crickets on the blog today. Enjoy the recipe, and be sure to say hello! Thanks Mandy!…..
Hey everyone! It’s Mandy here from Mandy’s Recipe Box. 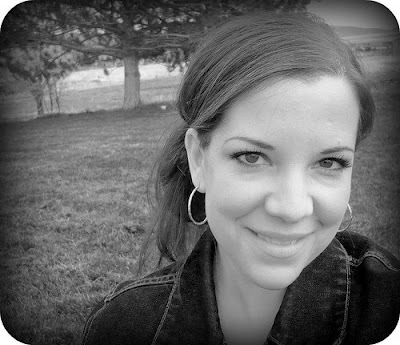 When Aimee asked if I’d be willing to guest blog for her while she and her family went away on a cruise (lucky duck! ), I didn’t hesitate to help out. Well, maybe a little since I’m completely jealous. I was born and raised in the city. I went to Utah State University where I met my husband-to-be. We married in 2000 and started our family a couple years later. We moved to the middle of nowhere, Idaho and now I’m a complete country girl. That’s what happens when you marry a farmer! I started blogging 3 years ago (I just realized my 3 year blogiversary was March 26th. Woot!) to share my love of food with others. It’s been so fun meeting other people and bloggers because of it. Today I’m sharing a delicious cobbler-cake. I call it that because it’s both. 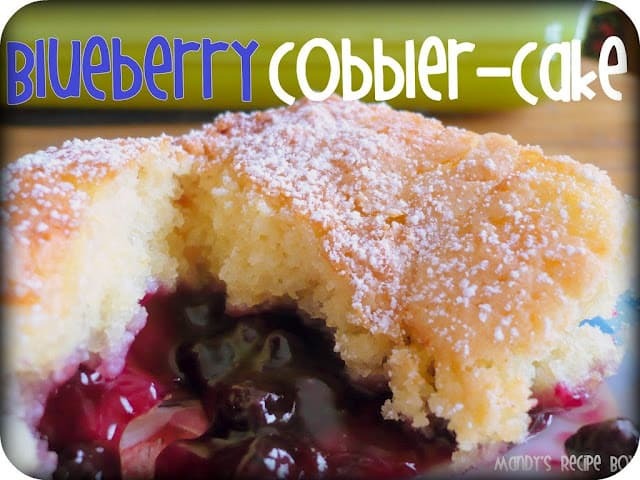 Not totally a cobbler, not totally a cake. Cream together butter, sugar, and eggs until fluffy. Add the almond or vanilla extract. Stir in flour and baking powder until smooth. 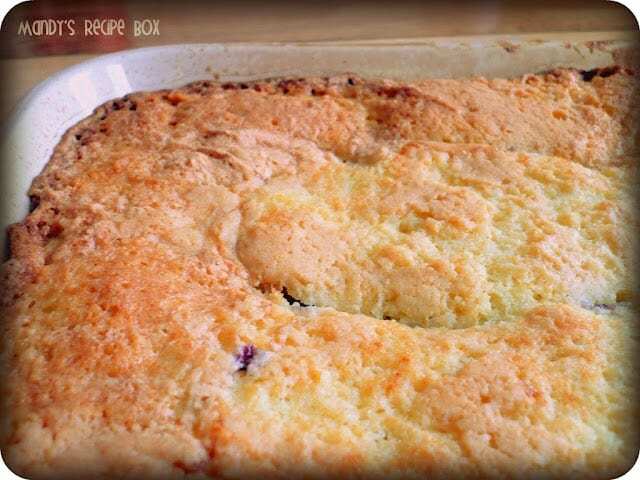 Put the batter in a greased 9×13 pan. Spoon the pie filling into the cake, in 16 spots, spacing 4 spoonfuls evenly in each direction. Bake at 350 degrees for 45-50 minutes. Filling will sink into the cake while baking. Serve warm. Dust with powdered sugar and add a dollop of whipped cream on top of each serving, if you want. I hope you enjoy this cake and please come visit me on Mandy’s Recipe Box, Facebook, and Pinterest. Thanks, Aimee! I hope you’re having fun! I’m pretty sure I need a bowl of this yumminess to get me through this Moday!! Awesome “cake” Mandy!!!! This is so amazingly versatile too. Any pie filling will work in the recipe. But I am partial to blueberry. We love your party on Tuesday and link up every week. Congrats on your anniversary. This recipe looks fantastic! 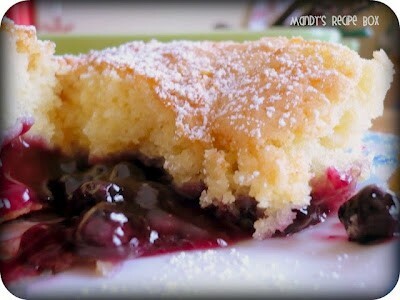 How do I make this with real blueberries? It sounds delicious but I always use real berries; I NEVER used canned filling.